Almost infinitely customizable for different applications -- call to discuss! Even when carrying a maximum load! Morooka can match a model to any job. Morooka USA manufactures the largest and most popular carriers in the Morooka range in facilities in Mechanicsville and Ashland, Virginia, USA. This assures our customers of product quality and suitability for the particular needs of the North American and South American markets. Fleet managers, Dealers and potential customers are cordially invited to inspect our manufactories—just give us a call to set up a tour. Availability of parts and other aftermarket services are also important pieces of the puzzle, and knowing that they are readily available and relatively nearby is another reason our customers choose to deal with Morooka USA. Our sister company, Dominion Equipment Parts, LLC, is one of the country’s leading providers of aftermarket rubber tracks, undercarriage components and Morooka parts, with eight warehouse locations in the U.S. and Canada. Safety and comfort for the operator translate into productivity on the jobsite, and Morooka carriers are designed with this fact in mind. All are equipped with a ROPS-certified canopy or cab and easy-to-operate controls. Climate-controlled cabs are standard on the larger models, and all feature a comfortable seat to fight operator fatigue. Models made in the USA feature a backup camera and heated remote mirror that enhance spatial and situational awareness for the operator, delivering an even greater degree of safety. A rugged Danfoss® joystick provides intuitive control of the carrier, and pairs with a video display console for control, diagnostics, and monitoring your unit’s performance. Rubber tracks combine the speed and smooth ride of a tire-equipped vehicle with the traction of a steel-tracked one. Rubber tracks offer the best of both worlds with low ground pressure and excellent traction. Our tracks also feature Continuous Wrap Technology, using a single, coated steel able in their construction to ensure that there are no weak points. Rubber tracks—as opposed to steel tracks—are faster, quieter and move more smoothly. They traverse environmentally sensitive terrain, like forest floors, with less damage because the greater length and width of the tracks in relation to the size of the carrier exert less pressure on the ground per square inch. When conditions are wet, muddy, steep or unsafe for other reasons, a rubber track carrier is the safest, most productive option. The full Morooka carrier line is designed with easy access to key service areas for ease of maintenance. This is accomplished by providing multiple access points for both the diesel engine and hydraulic components. Additionally, the simple design of the travel system contributes to overall durability as well as simplified maintenance. Parts and aftermarket support are also conveniently available from our various locations in the USA, from our parts company, Dominion Equipment Parts. 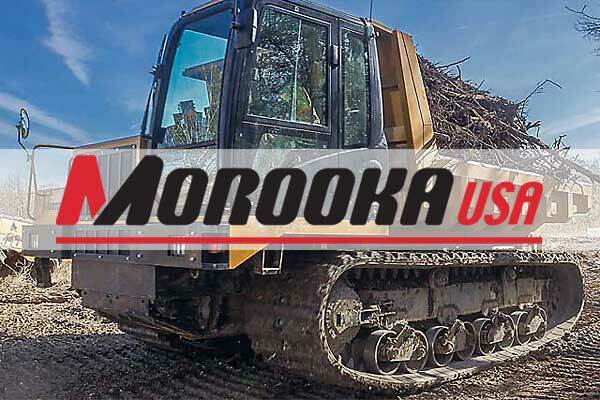 The Morooka company was founded in 1958 and today all Morooka rubber track carriers are built on the original floating bogey undercarriage system. The floating bogie-wheel undercarriage on Morooka machines is always in contact with the ground, absorbing the impacts of uneven surfaces. This unique undercarriage delivers a stable, smooth ride with less vibration that, in turn, results in less driver fatigue and more productivity. This smoother ride also mitigates stress on the machinery, helping extend equipment life. The hydrostatic transmission (HST) used in the Morooka carrier line accesses the engine’s full power more efficiently. The HST was chosen for Morooka carriers rather than a shifted gear transmission for its “stepless” change in speed ratio. Gear transmissions, whose working range is determined by torque and gearing, have a limited working speed range in challenging conditions. In contrast, every speed is a working speed for the HST. A hydrostatic transmission also completely eliminates the need for clutch and gear controls, making the Morooka carrier easier to operate, with greater maneuverability.